ESE students collaborate with other campus groups to create an Ideas Festival for Purdue’s Giant Leaps Sesquicentennial Celebration. Their ESE Symposium will be a part of this Ideas Festival, and will include Katharine Hayhoe, a world-renowned climate communicator, as a keynote speaker, as well as other workshops, panels, and events to explore and promote various ways to communicate science through both academia and art. Read more in this article. ESE faculty member Dr. Andrew Whelton leads study on how Flint, Michigan dealt with water bottle waste after lead contamination. Read more in this article. Congratulations to Paula Welikhe, who won 1st place at the 2018 Agronomy Society of America (ASA) Nutrients and Environmental Quality Community oral presentation competition! Her talk was on "Development and Evaluation of Phosphorus Sorption Capacity - Based Environmental Indices." You can read the abstract here. ESE faculty member Dr. Jeff Dukes was featured by Purdue University as his sustainability research aligns with Purdue's Giant Leaps celebration, acknowledging the University’s global advancements made toward a sustainable economy and planet as part of Purdue’s 150th anniversary. This is one of the four themes of the yearlong celebration’s Ideas Festival, designed to showcase Purdue as an intellectual center solving real-world issues. ESE Faculty member Marisol Sepúlveda is the recipient of the 2018 Agricultural Research Award. 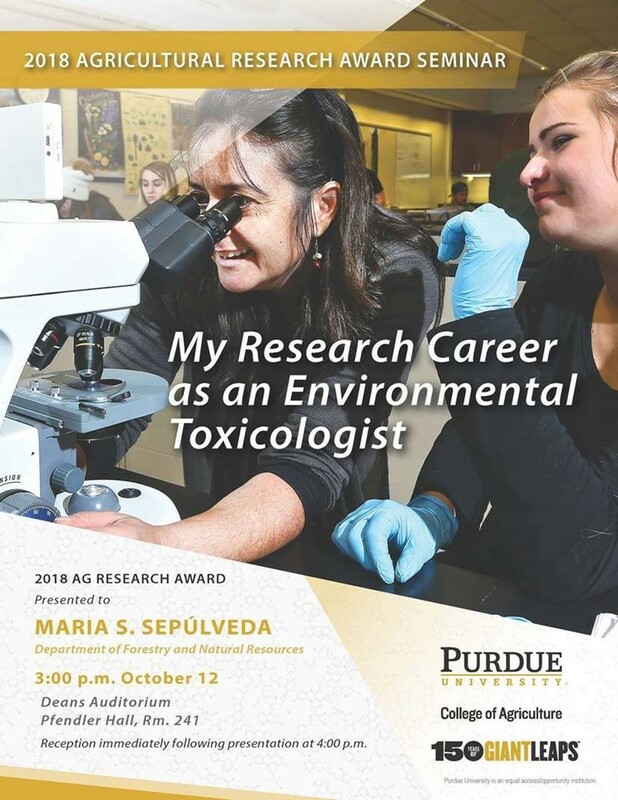 The award presentation, along with Dr. Sepúlveda’s seminar on “My Research Career as an Environmental Toxicologist", will be Friday, October 12, at 3:00 p.m. in PFEN 241. Reception to follow. First year ESE student Rasul discusses his research and experience in the summer Graduate Bridge Program.